If you live on a hilly block, chances are you've heard our local skateboarders risking life and limb for the thrill of the wind in their hair. When there are several of them flitting by, it sounds like a freight train passing. 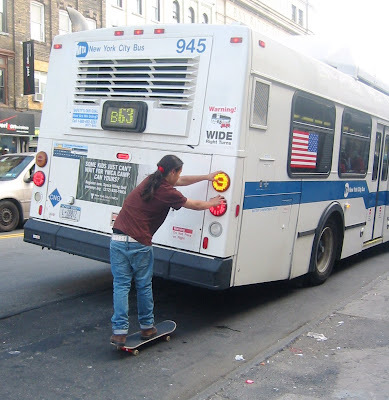 Here's what this skateboarder does to save his energy on the level streets. Better watch it, the MTA might start charging half-fare for this.